Directed by Roque Cameselle, the film tells the story of Bieito Dubidoso, the titular little wizard who uses his powers to save his father's life from the Normans. The evil Bishop Juan feels that the boy has dark powers and does everything to get rid of Bieito and his friend, Destreza. The Little Wizard premiered at the San Sebastian International Film Festival in September and gets its Spanish theatrical release on November 15. 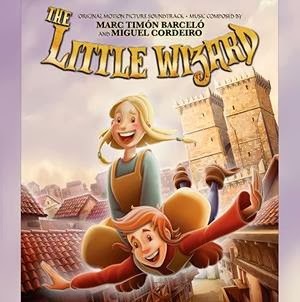 The music for The Little Wizard was written by Spanish composers Marc Timón Barceló and Miguel Cordeiro who provided a John-Williams inspired animated adventure score with many memorable themes and several recurring leitmotives. The score has been nominated for the Jerry Goldsmith Award at the International Film Music Festival as well as the Spanish Film Music Critics Award. The music for The Little Wizard was written in about two months before the score was recorded in Bulgaria. Composer Marc Timón recalls the recording experience: "Hearing and conducting your own music so well performed is the best gift that you can receive as a composer. More than a year later it’s nice to see that our efforts had a point and all that stress we felt back than has been converted into beautiful music we can all enjoy." 5/5 Sometimes you can say "save the best for last" and this is the case in this score "The Little Wizard" is a big player in great scores for 2013. I think efforts made here to create a magical moving score were a complete success, composers Marc Timón Barce ló and Miguel Cordeiro created a wonderful piece. Bravo to them and future releases from them, thank you for making it epic!